When was this map ordered and by whom? Check out this map at Adam Isacson’s LatAm blog, showing the hometowns of the unaccompanied children the U.S. Customs and Border Protection has apprehended between January 1 and May 14, 2014. So just to be clear, the problem is not that there are thousands of children who decide to leave their home, alone, to escape violence or abject poverty and search for a better future. No no no. The problem is that somebody made a map about it. Look you Tea Party nuts, no matter how hard you try, you will never ever be able to make a reasonable argument that the immigrants of your great-grandparents’ era and before were “good immigrants” and today’s immigrants are “bad immigrants”. Don’t take my word for it, ask a Native Indian. On a side note, last week marked the 60th anniversary of the 1954 Guatemalan Coup. Didn’t hear much about that on Fox News I take it? Without a shadow of a doubt, US intervention in Guatemala and other parts of LatAm has influenced life in LatAm as we know it today. But the right wing nuts don’t see that as an issue now, no no no, the problem is that somebody made a map of it. 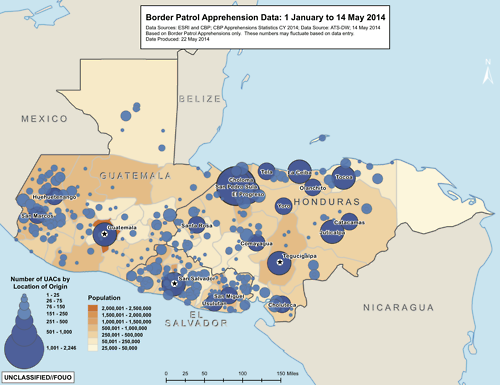 This entry was tagged Guatemala, unaccompanied children map. Bookmark the permalink.